Hello people of the craft world! Today I have made a smaller card than my usual A6. The whisper white measures 4 inch x 4 inch that's 10cm x 10cm once folded. The stamped whisper white piece is 3.5 inch x 3 inch that's 8.8cm x 7.5 cm. 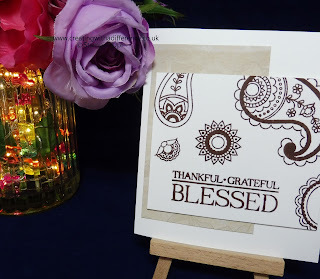 I loaded up my misti with a few of the images from the paisley and posies stamp set and inked up with chocolate chip ink. I adhered everything with tombow liquid glue. Click HERE to see the matching video tutorial. All content on this blog is the property of Charley Zakrzewski, Stampin' Up!® Independent Demonstrator. Classes, services and products offered here are not endorsed by Stampin' Up! Projects, videos, photos, ideas and articles are shared for personal use only and may not be removed, duplicated, or copied without permission. Stampin' Up! Charley Zakrzewski. Awesome Inc. theme. Powered by Blogger.